Dog Parks in High Demand – FIREPAW, Inc.
Americans really have started to go to the dogs, it seems. The latest annual Dog Park Rankings from the Trust for Public Land is out, and it shows that parks for pets are becoming increasingly popular. In fact, thriving dog parks are coming to signify the most sought-after, dynamic communities and those communities with the most dog parks also have the most robust housing markets. Woof! According to the Dog Park Rankings from the Trust for Public Land…There are now 774 dog parks in the 100 biggest metro areas, a nearly 5% increase over last year and up 40% since the trust started keeping track, in 2009. 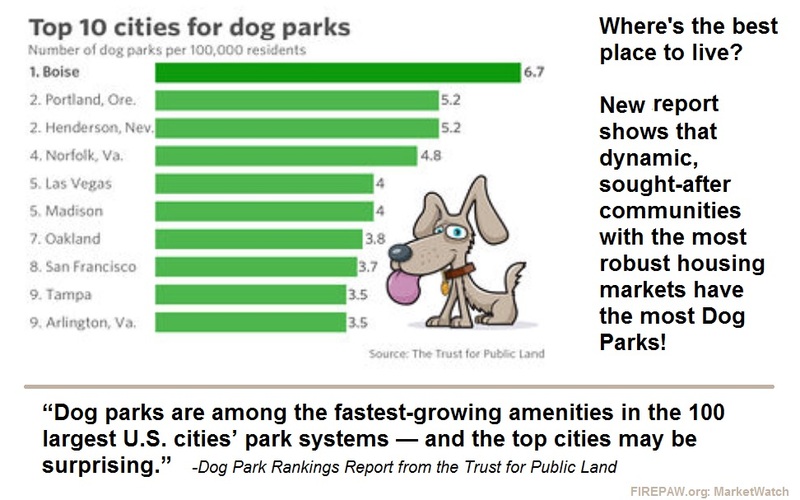 “Dog parks are among the fastest-growing amenities in the 100 largest U.S. cities’ park systems — and the top cities may be surprising,” the trust wrote in its analysis. Don’t have a dog park where you live? Why not partner with like-minded souls in your community and start the planning process. The Trust for Public Land suggests reading tips from a company that helps engineer dog parks and some best practices from the city of Ann Arbor, Michigan.